A Dobsonian Telescope is simplicity in itself; a simple set of optics on a simple mount. But don’t be fooled by this simplicity. Dobsonian telescopes are incredibly good and are great for amateurs and professional astronomers alike. They are also very economical compared to other telescopes. The optical part of the telescope or OTA (Optical Tube Assembly) is the same as a Newtonian reflector telescope. It consists of a primary parabolic mirror and a flat secondary mirror in an open-ended tube, with a focuser for an eyepiece set on the side. Light enters the tube, reflects off of the primary mirror at the base and is then focused onto the smaller flat secondary mirror and then finally, into an eyepiece. Simple! Both Dobsonian Telescopes and Newtonians are measured by the size of the diameter of their primary (big) mirror. Dobsonian sizes range from starter scopes of 6 inches up to 30 inches, but common sizes are 8 to 16 inches in diameter. They can be many times larger and less expensive to produce than scopes with lenses. The second part of a Dobsonian Telescope is the mount. As with the optical part the mount is just as simple, if not more so! A basic manual mount which supports the optical tube and can be manually moved by hand in the Altitude (up/down) and Azimuth (left/right) axis. The mount is usually made from wood or metal with bearings and support for the two axis of movement. More so lately, some manufacturers have put GoTo systems with motors on some Dobsonian mounts. Personally I think it’s a bit over kill for a Dobsonian telescope, as finding objects manually by star hopping or other manual methods helps you learn the sky better and can be fun. Resist the urge to spend lots of money on small computerized scopes that will eventually never get used, as they can be too complicated or you may not see much through them apart from the brightest objects such as the Moon. 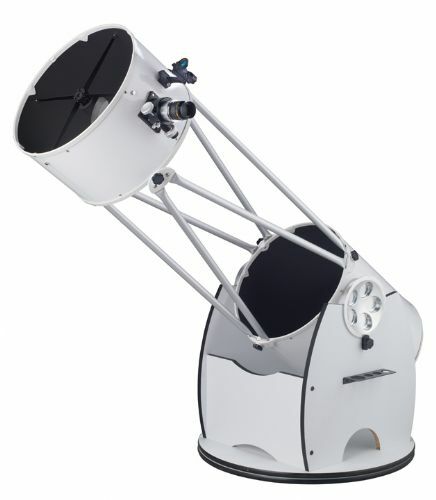 A Dobsonian telescope is a great all-around telescope, and are available in almost all telescope stores. Some people make their own homemade Dobsonian scopes too!